In areas that experience high winds from seasonal weather, thunderstorms or hurricanes, one of the first things to fall on a property is a wooden fence. These fences create a block for the wind that eventually tosses the fence to the ground. For wind resistance, you need to build a fence with gaps in it to let the wind blow through it. This reduces the force the wind has on the fence and reduces the chances that it will fall. Gaps between boards on a fence let wind through. Dig a post hole three times the width of the post and 30 inches deep with the digger every 8 feet along the fence line. Pour a 2-inch-deep layer of gravel into the base of each hole. Have someone hold a fencepost on top of the gravel while you pour concrete around the base of the post to the top of the hole. Check the level with a carpenter's level of all the fence posts before bracing them. Nail two spare boards on either side of the fence post at opposite sides of the post to brace the fencepost upright until the concrete hardens. Follow the directions on the package of concrete mix for the drying time. Remove the supporting boards from the fence posts by pulling out the nails from the fence posts with a claw hammer only after the concrete has dried. Nail the end of a fence rail 6 inches from the ground with each end of the rail at the midpoint of two fence posts. Attach bottom fence rails to the posts until you reach the end of the fence. Attach a top rail 6 inches below the top of the fence posts following the same technique used to attach the bottom rails. Nail a fence board on the front of the fence to the top and bottom rail of the fence. Place the next board 1 to 2 inches from the first board, but nail it to the back of the fence on the top and bottom rails. 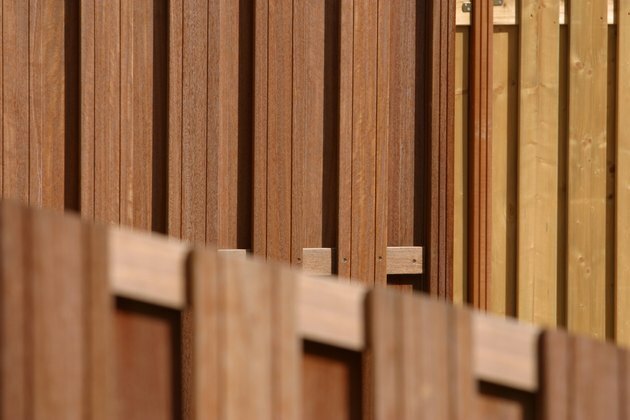 This interlap fence is stronger than a picket fence with all the boards on the same side, and the gaps between the boards make it wind resistant. Repeat interspersing boards on the front and back of the fence with 1 to 2 inches of space between the boards.